OK. It’s another quilt. Yeah. I know. Send help!! It’s an obsession! This is a gift for one of my dearest friends, one of the very first people I met when I moved to New York. She’s expecting a baby boy next month, and I’m just so excited to meet him! So when I saw Miss Make‘s wonky log cabin tutorial, I knew I wanted to try it! 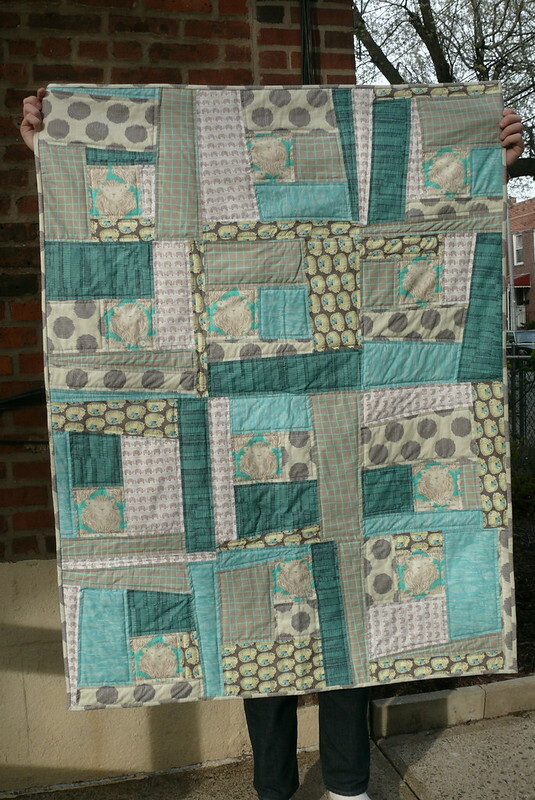 I like that it’s a free-form way to build a quilt and that you don’t really need to be precise. Plus, the end results are so cool! The quilting part went much more smoothly on this quilt, thanks to the suggestions in The Practical Guide to Modern Patchwork. * I bought curved safety pins and they made a huge difference. And instead of trying to stitch in the ditch, I quilted 1/4″ from the seamlines inside each piece to kind of emphasize the irregular shapes created by the wonky log cabin process. It looks much better! The only trouble I ran into with this project is that I found I needed more fabric than Devon suggested. I picked up an extra 3/8″ yard of fabric from the get-go and needed to buy another 3/8 to get the blocks to the correct size. So maybe grab a bit more just in case if you follow her tutorial. I used a leftover strip of Indelible Threaded Shreds Dim to finish the backing… it’s leftover from Hazel Hedgehog! 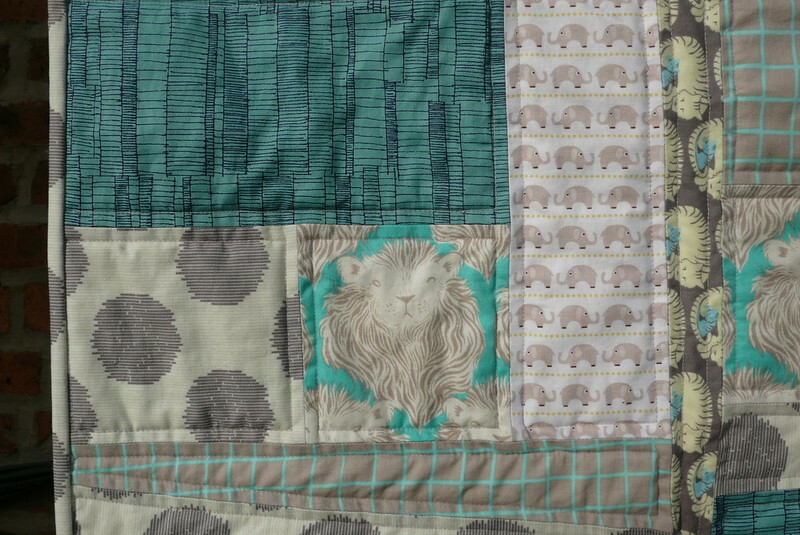 I really liked making this quilt, mainly because it was fun to make something for a dear friend with another dear friend, but also because it’s so stress-free to construct quilt blocks this way. If you’re looking for a way to try out quilting but you’re worried about accuracy, you should really give this a try! C’mon, do it!! We can be quilt-obsessed together! 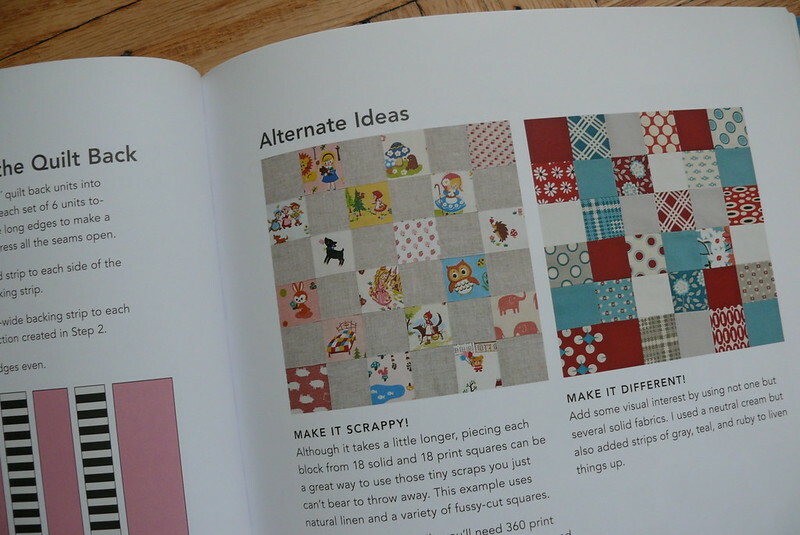 *Before I forget, the winner of the Practical Guide to Modern Patchwork giveaway is Laura! Congrats!!! Also, I just realized I never announced the winner of the Girly Style Wardrobe giveaway! It was Raquel from JC… I sent her the book ages ago, but forgot to mention it on the blog! Hope you’re enjoying the book, Raquel! 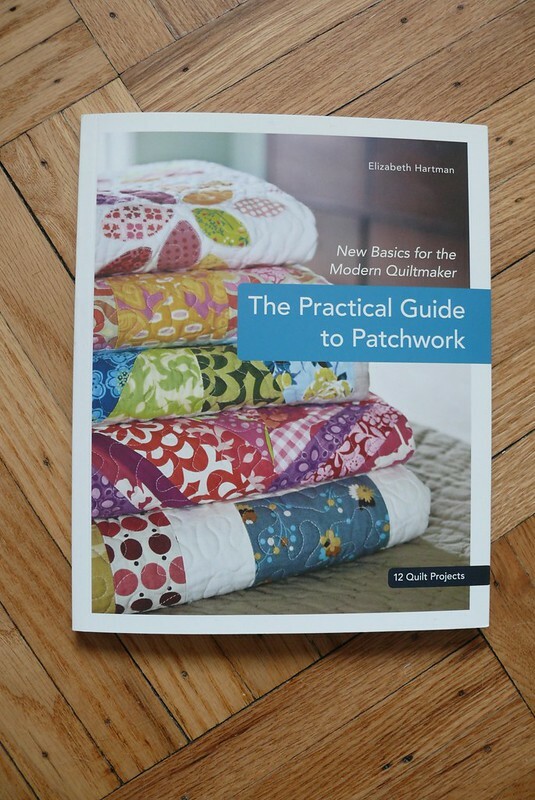 Book Report + Giveaway: The Practical Guide to Patchwork! Hi, guys! Hope you’re all well! 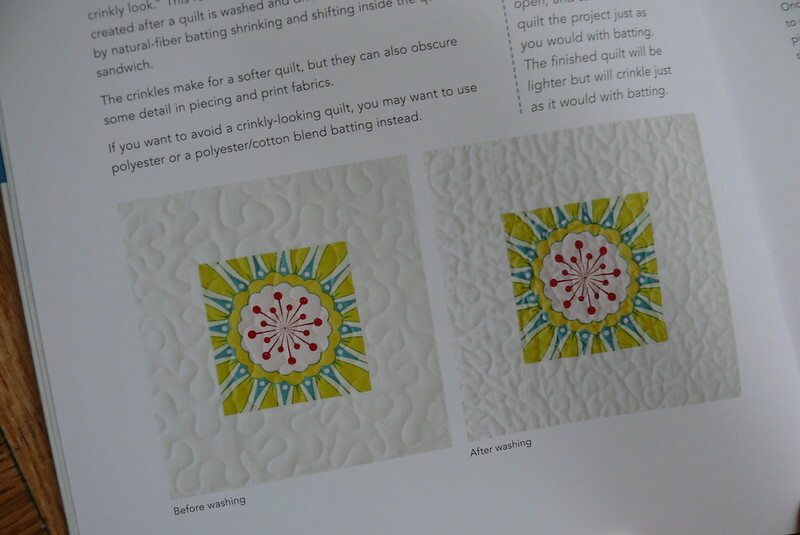 Today I’d like to share a book I picked up recently and really enjoyed… but don’t hate me… it’s a quilting book! Guys, I can’t help it! I’m kind of getting into quilting! It’s scary. And weird. But the thing is, planning a quilt project is just so fun! 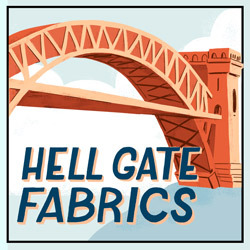 There are so many cool fabrics to choose from, and thinking about all the different shapes and combinations has literally kept me awake at nights lately. I know. It’s crazy. ANYWAY. 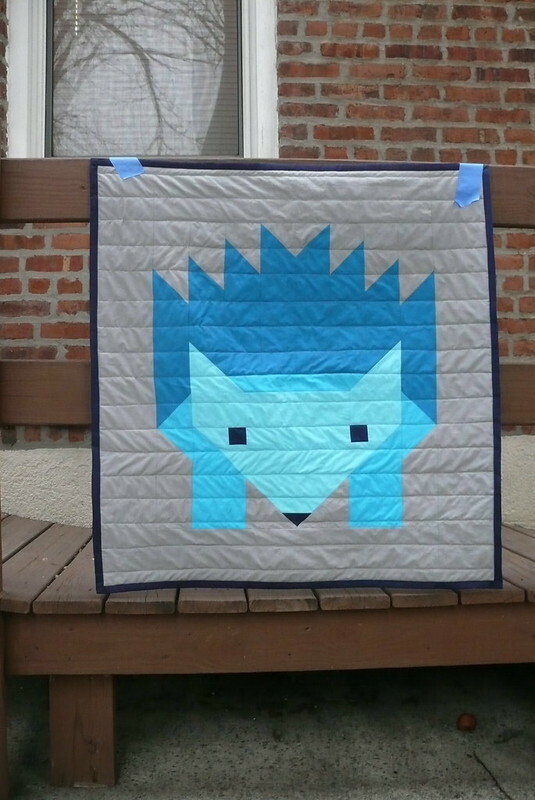 After fumbling through Hazel the Hedgehog, I decided that I should probably learn a little bit about the right way to quilt before jumping into my next project! 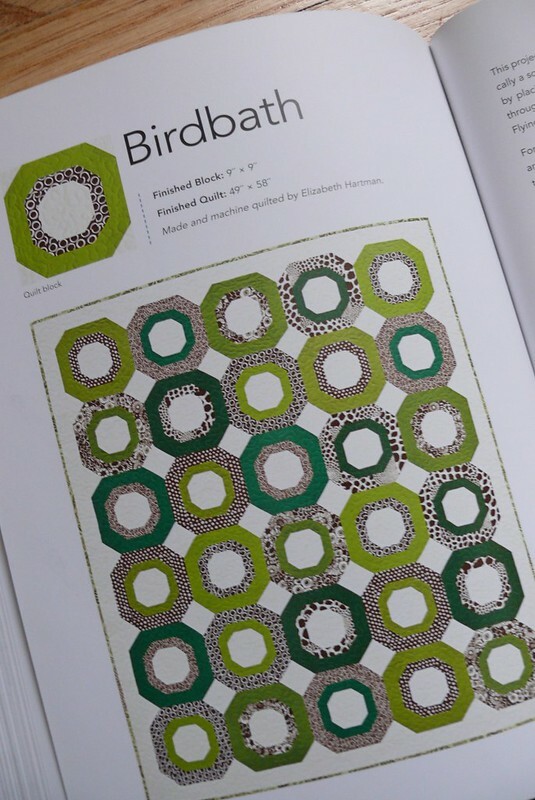 I picked up The Practical Guide to Patchwork by Elizabeth Hartman, the designer of the Hazel the Hedgehog quilt pattern. I really love this book! 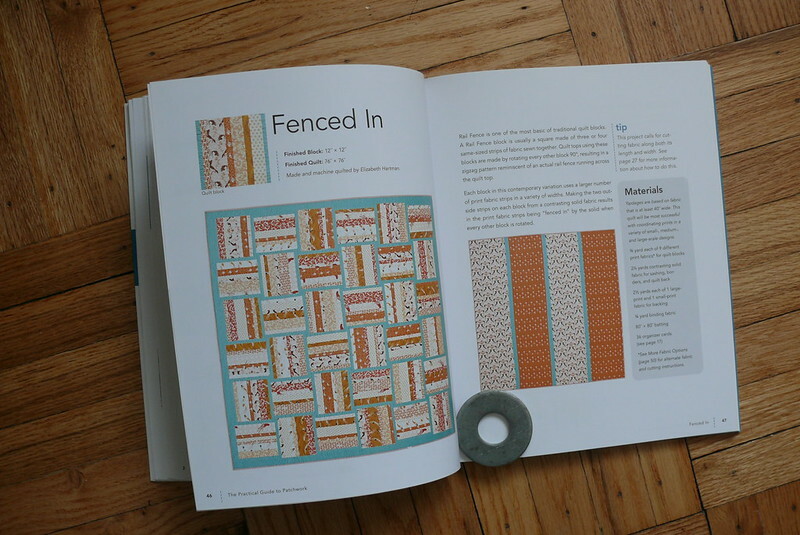 In my opinion, it’s an ideal book for anyone who wants to dip their toe into modern quilting. 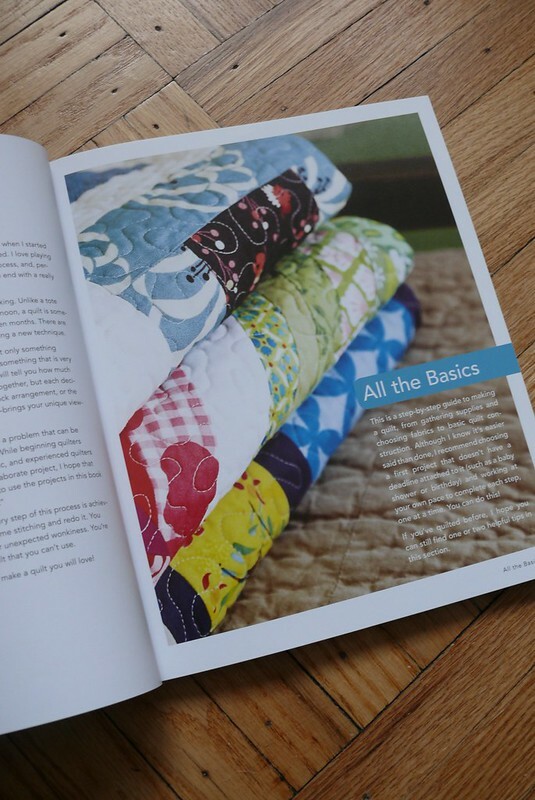 The book starts out with the basics of quilting and answered lots of questions I had, like, what’s a fat quarter? Or, should you pre-wash your fabric? It lays a good foundation without a lot of boring stuff like “these are scissors”. 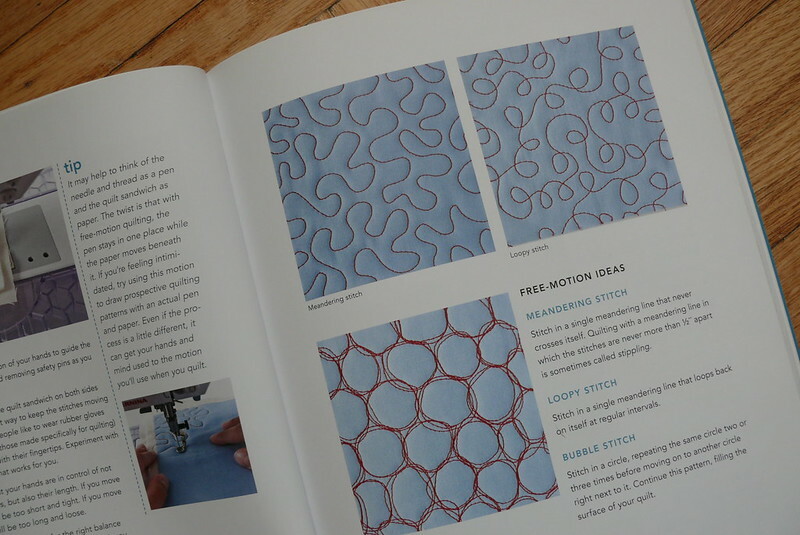 Elizabeth covers cutting, piecing, quilting (by machine only, but she recommends another resource if you’re interested in hand quilting), and binding. 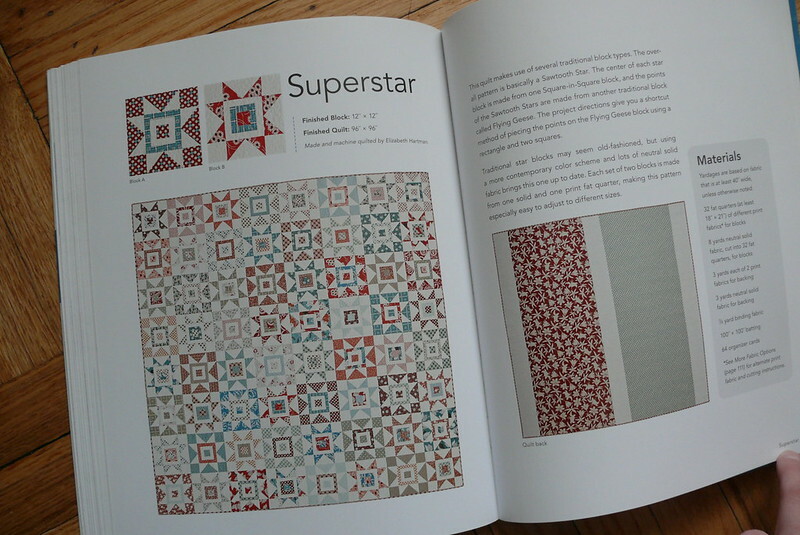 There are twelve quilt patterns included in the book, and they’re all pretty fun. 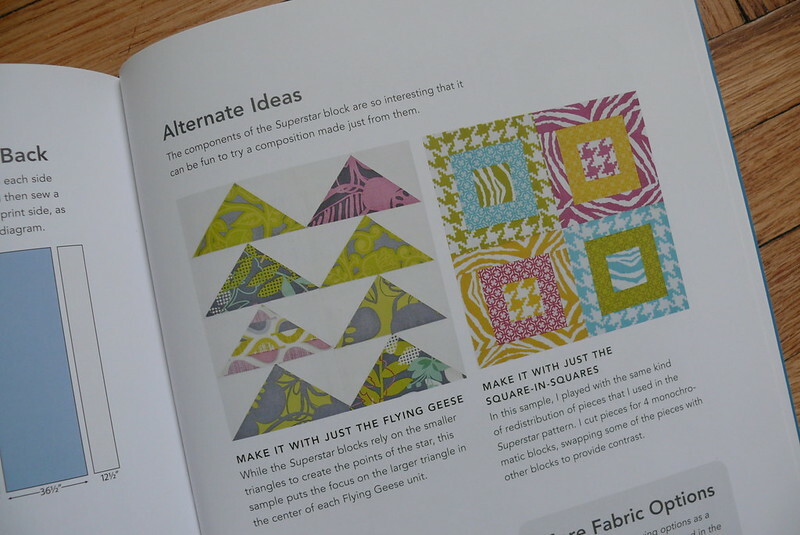 I like that she also includes an idea for your backing with each pattern… it’s cool that you can experiment on both sides of your quilt! 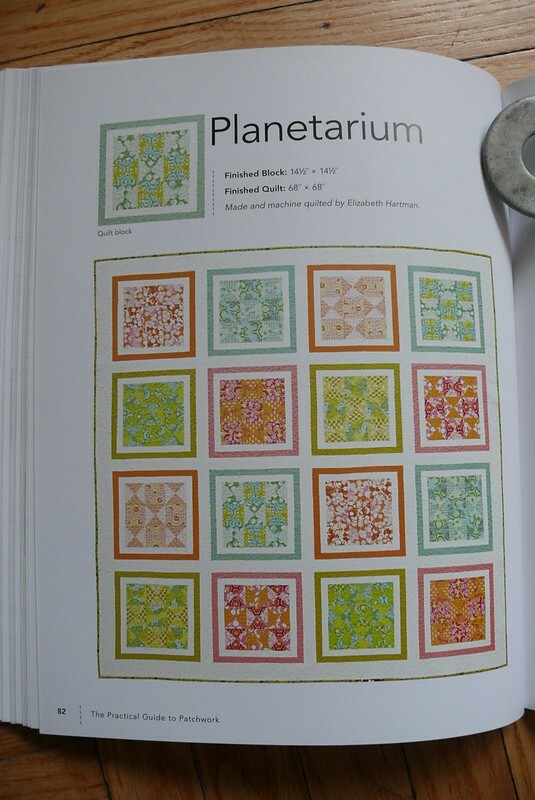 Something I really like about the book is that Elizabeth gives different ideas for changing up each of the patterns. It’s pretty easy for me to think about a garment pattern and imagine many possibilities for it, but I haven’t developed that eye yet for quilting, so it’s nice to see the potential variations for all these quilt patterns. 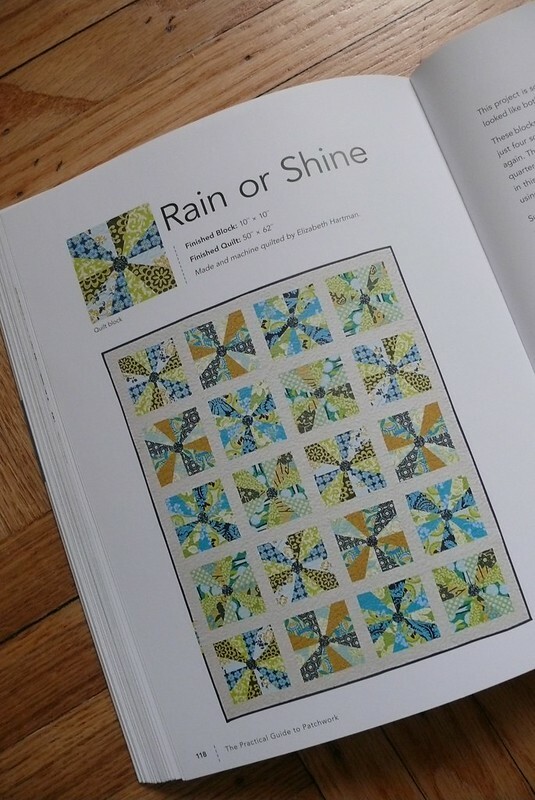 The book focuses on modern quilting, which is super interesting. 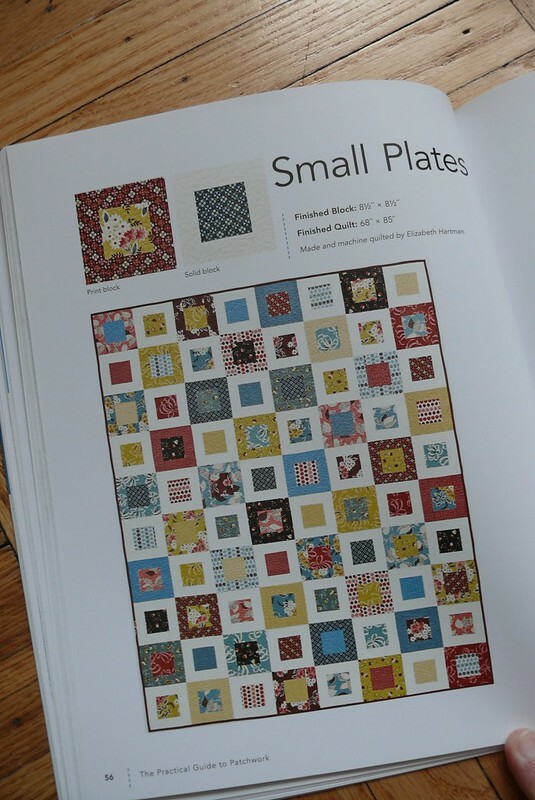 I have mentioned before that my mom quilted lots when I was a kid, but she is a hand quilter who is mainly interested in traditional patterns, so I haven’t really seen these kinds of quilts before. I love the looks of old-fashioned quilt patterns like the drunkard’s path or double wedding ring, but I also really like these bold modern designs. Isn’t it fun to think about how you can make these styles your own? 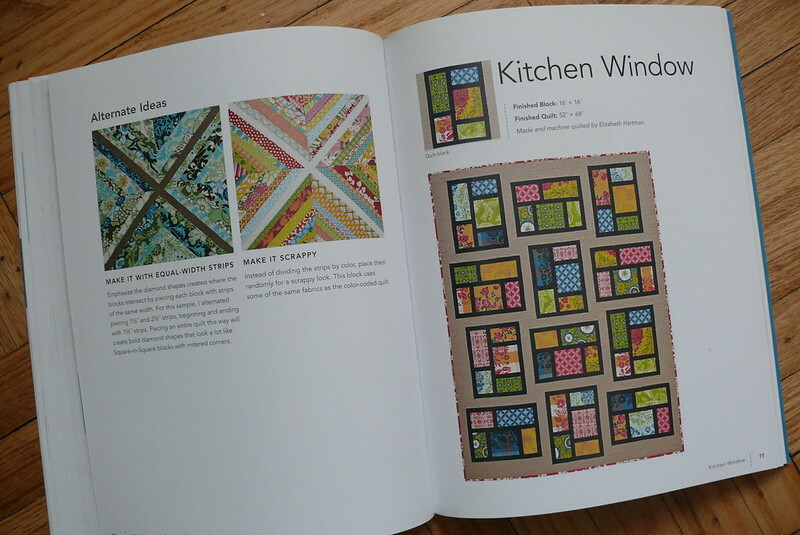 I would love to play with blocks of bright color for my own Kitchen Windows quilt. Planetarium just looks super fun to sew! I wanna try it! 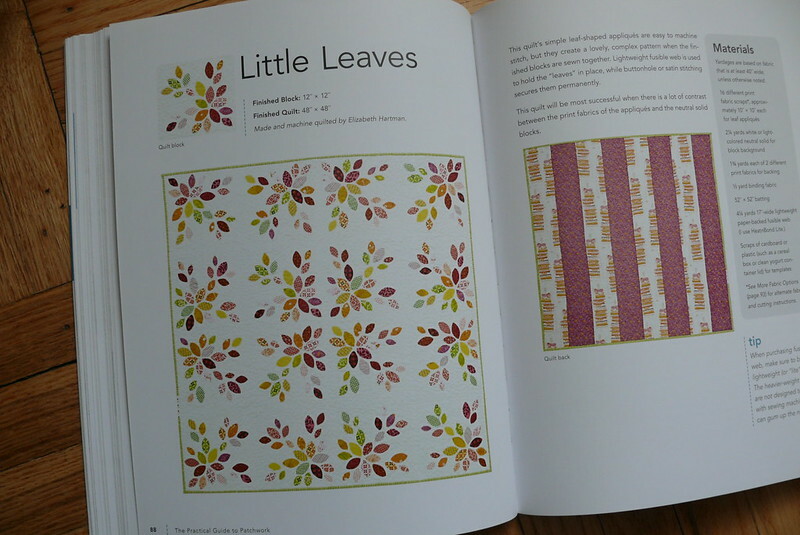 Little Leaves teaches you how to applique, which seems pretty free-form and loosey-goosey… what’s not to like about that? I would like to own a quilt made from this pattern but I would not like to cut, piece, or quilt it. Too many pieces! But look at these fun variations on the Superstar! 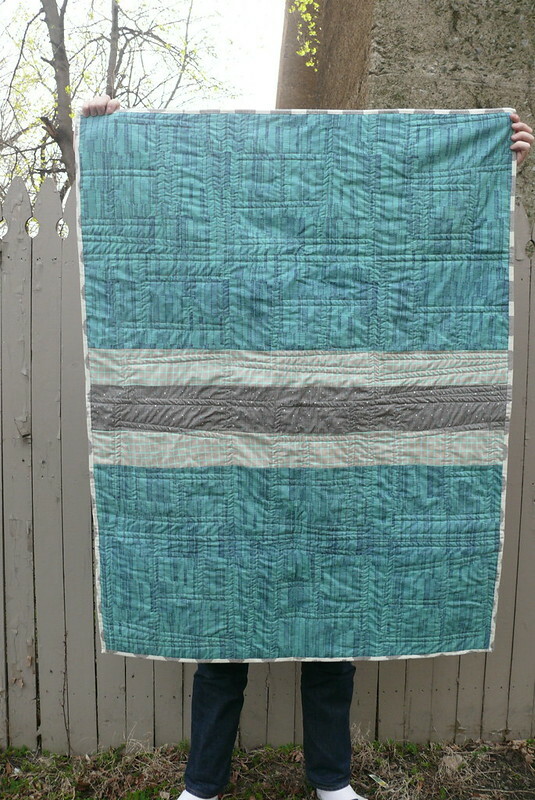 I really like the colors she’s got here in the flying geese variation- wouldn’t they look cool in a quilt??? I really like Birdbath! I think it would be fun in hot pinks and greys, maybe. Ooh- and zebra print, just to be wild! This crazy windmill block looks really cool! I bet there’s a way to create a 3D effect in a monochromatic color scheme… wouldn’t that be awesome? Alright, guys, I love this book so much that I’d like to give away a copy to one of you! I’ll ship it anywhere in the world (since I’ve found out that Book Depository offers free worldwide shipping, it’s much more affordable for me to do that, yay!! ), so if you’re interested, please fill out the Google form below before Monday, April 20th at 11:59PM EST! I’ll draw a winner using random.org. Yay! Now tell me- which one of these patterns is your favorite??? Do you have a favorite traditional quilt pattern? Any of you convinced to start quilting??? Do tell! Hi, guys! I have a special post for you today! I’m taking part in a virtual baby shower for the lovely Vicki Kate, and am thrilled to do so! Annabelle Bumps organized it, and I thought it was the best idea! Vicki Kate is so sweet and always has a kind word at the ready… she’s really been a great friend to me over the last few years. So I’m really excited to help welcome her new baby into the world, whenever s/he decides to arrive! If you fancy taking a peek at the other gifts, hop on over to see the other participants’ posts! I went to City Quilter to pick out fabrics and came away with an assortment of American Made Brand cotton solids (I’m pretty sure this is light aqua, dark aqua, dark sky, light grey, and navy). I thought the colors would be pretty for either a boy or a girl, but I wasn’t quite sure what they would look like sewn up. 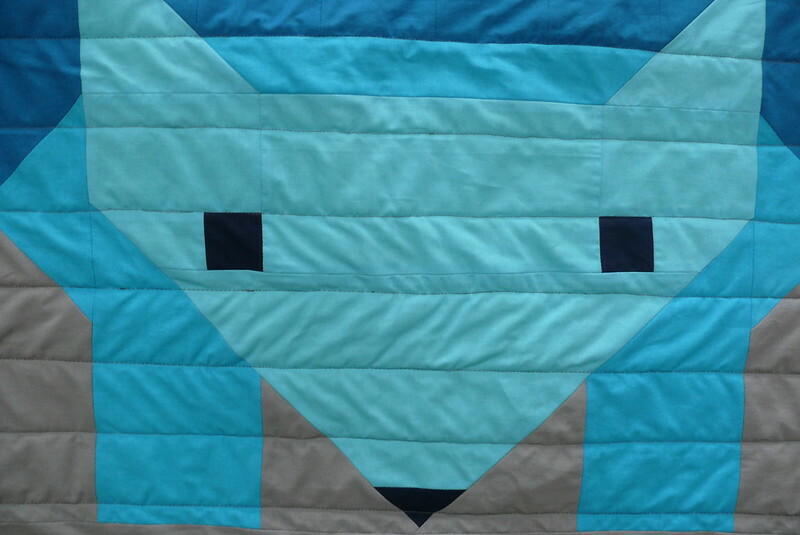 It’s a little tricky to visualize what a quilt will look like… takes practice, I guess! In the end I like the colors together… phew! I chose this fabric, an Art Gallery Fabrics print, for the backing. It’s so easy to find coordinating prints in a quilting shop… so many fun bolts to choose from! So, quilting. It’s so different from garment sewing! I spent 2.5 hours cutting out the blocks and 3.5 hours piecing the top, with the latter being much more fun than the former. I think I made some mistakes in my measuring and cutting because I had to trim some pieces down to get things to line up correctly. Oops! 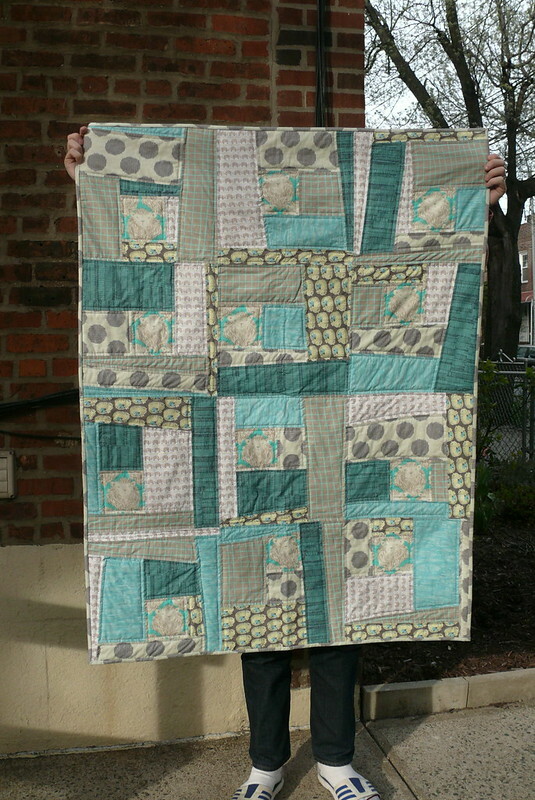 It took me forever and a day to mark the lines to quilt on… I couldn’t seem to get them evenly spaced or straight! In the end I have (semi-) horizontal lines about 2″ apart. 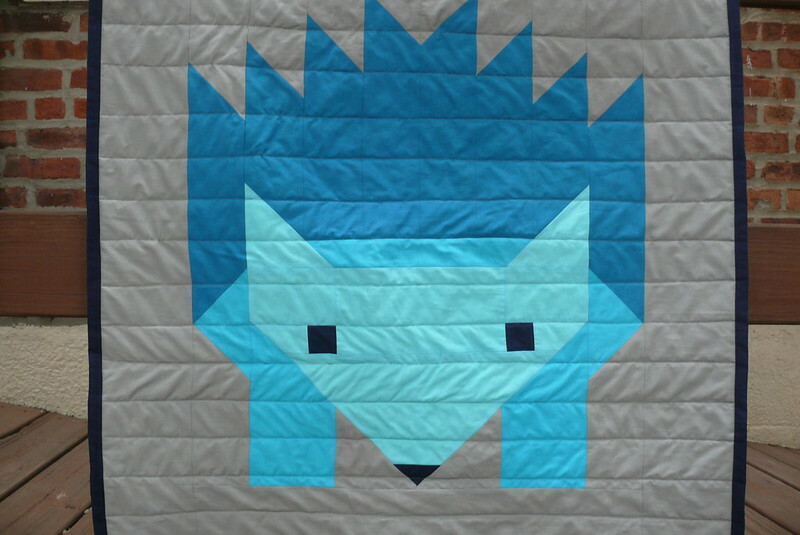 I really struggled with the quilting part, though. My walking foot didn’t really seem to be up to snuff, and I struggled to get even stitching (the top layer kept getting dragged across the quilt, despite using tons of pins and sewing verrrrrry slowly). I spent hours seam ripping and re-doing the quilted lines, but in the end, they’re still pretty wonky. 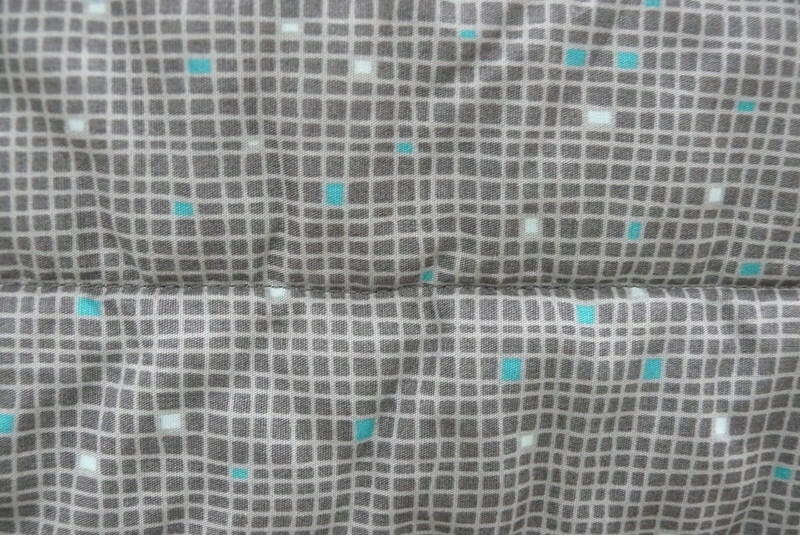 Also, the grey thread I picked to quilt with doesn’t seem right now that I look at the finished thing. OK, just don’t look too closely, Vicki!! I used a double-fold binding (cut from my fabric) that I stitched on by machine, wrapped around to the back, and slip stitched in place by hand. I used this tutorial to figure out how to miter the corners… it’s confusing to think about, but easy enough to do once you sort it out. 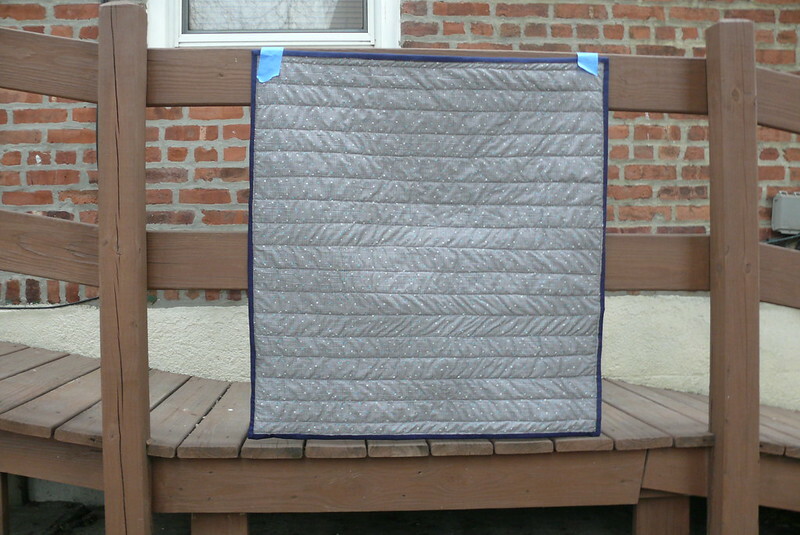 I used a cotton batting from Steinlauf & Stoller that has a really pleasing feel… the quilt is really squeezable! Vicki, I hope you like this and that your wee one does, too! Please forgive the messiness! And keep an eye on your mailbox… it’s winging its way to you! All the best to you and your family! Much love, and congratulations!! !